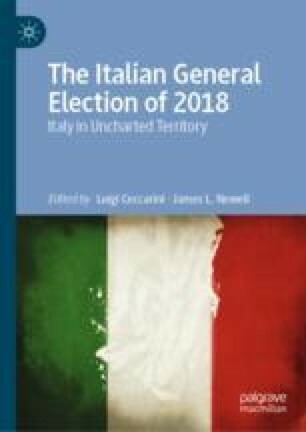 The Italian general election campaign of 4 March 2018 conducted on the Internet was the first completely digital one in its history. This chapter analyses the Facebook communication strategies and tactics adopted by the political leaders in the recent campaign. It investigates each of their characteristics and evaluates their effectiveness in terms of their capacity to create online engagement, to construct their messages, to emotionalise their content and to hybridise their campaign channels. The underlying hypothesis is that a new model of digital communication is emerging, one that is being exploited principally by Italy’s young, emerging leaders, namely Matteo Salvini (League), Luigi di Maio (Five-star Movement) and Giorgia Meloni (Brothers of Italy). Firstly, they are the leaders of new political parties; secondly, they present themselves as the leaders of post-ideological political forces; and, finally, they adopt a populist communication style. This hypothesis of an emerging model of strategic communication, more effective in terms of online engagement, is confirmed by many of the analytical dimensions considered.